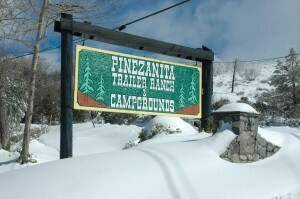 Christine, with the help of her family, nurtured the business known today as Pinezanita RV Park & Campgrounds. To us, she was and always will be the true spirit of Pinezanita. From our early beginnings of handing out shovels and rakes so campers could clear themselves a camping spot, to where we are today, Pinezanita has blossomed from those early beginnings in 1960. It has seen its’ ups, and some downs, but we remain focused on providing you with an excellent location to nurture your own family traditions. For those of you who have stayed at Pinezanita RV Park & Campgrounds, you know that this park is unique from any other camping or recreational campground. That’s because when you come to Pinezanita, you are really vacationing in our backyard. Early on, the Stanley family would use this property as a weekend retreat until we moved here permanently in 1960. This is the place where we raised chickens, dogs, steers, rode our horses, hiked and adventured. 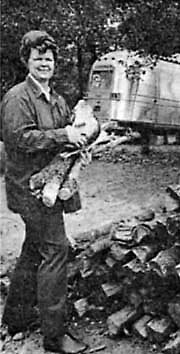 Our dad and uncles trapped the wild game in the area, and we cleared the land, cut, split, and sold cords of wood for extra money. Our family moved to Julian in 1960 and in 1964, our mother Christine and a friend, Lola Tracey, started Pinezanita Gift Shop. The gift shop’s name was created by taking the “pine” from pine trees and the “zanita” from the lush brush called Manzanita that grows profusely in the Julian area. The idea for the business came from the crafter’s who were making resin grapes and wanted to attach their grapes to gnarly natural roots or stumps that looked like grapevines. What developed was a flourishing business where Christine and Lola created gorgeous floral arrangements. Early on, our father Alfred (or “Red” as most knew him) ran two very successful plumbing businesses; first in San Diego and later in Julian. A heart attack claimed his life in 1967 leaving Mom with 26.5 acres of pristine mountain property and 5 children to raise on her own. Mom was 39 years old, a real turning point in most lives, and was now responsible for all of us. Our mother and father always had the dream of creating a campground that they often talked about, but never did anything about. When Christine was faced with the reality of raising five children alone, and not wanting to return to the city, she quickly developed a plan to create her dream campground. Without knowing it, she was to become a forest conservationist as well as a shrewd businesswoman. Christine dug out that early artists’ rendition of Pinezanita from her closet, rolled up her sleeves, and proceeded to go to work. In 1968, with the help of a La Jolla, CA investor, the undeveloped 26.5 acres of pine, oak, and Manzanita covered mountain property located four miles south of Julian became the start of Pinezanita RV Park & Campgrounds. The property already had a two story building at the entrance that was the Pinezanita Gift Shop. That building would become the registration office and camping store with restrooms, showers, and a laundry room downstairs. Today, that building has been remodeled with modern restrooms both upstairs and downstairs. The large home that lies in the center of Pinezanita was created from a bunkhouse and shop used by nickel miners as late as 1947. Our parents and relatives renovated the house and it was our residence until 1972. That house has been a rental since that time and is now divided in half forming two of our three exquisite Overnight Rental Cabins. We’ve tried to keep the “You’re a Guest in Our Home” flavor with all of our rentals… it’s just like you came to spend the weekend our at Mom’s house. In 1989, the business had reached another turning point, and Christine asked her son Tom to stay and help with the business. Christine, Tom, and Barbara (Sandy in 1999) worked side-by-side until sadly, Christine passed away in 2005. Christine wanted the family business to continue on, and with that Tom, Sandy, Barbara and the rest of the family have carried on the tradition. Over the years, our “Little Piece of Heaven” has gone through some amazing transformations and is a place we’re proud to have families come to rest, relax, and enjoy. Come stay with us to experience the great outdoors and all that the Julian area has to offer!